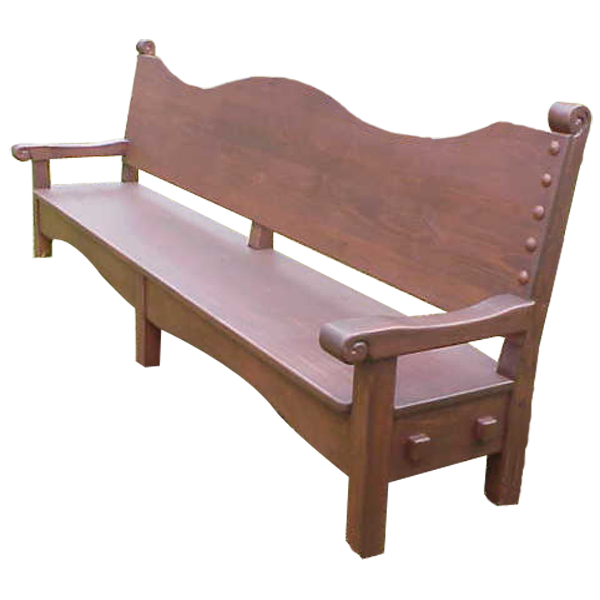 This marvelous, handcrafted, Spanish colonial style bench has a large, wide frame, and it can be modified to any size that is appropriate for your home décor. The solid wood seatback has a dramatic, curved design, and the seatback is attached to its scrolled uprights with hand forged, iron nails. It has a solid wood, robust seat, with scrolled armrest on each side of the seat. The bench rest on six straight, square cut legs. It has a classic, antique finish, and it is made with the best, sustainable, solid wood available. It is 100% customizable.